The San Pellegrino quarter is the symbol of the ancient medieval city and contains an interesting variety of 1200s architecture. The houses facing along Via San Pellegrino have one or more floors built directly on the tufa stone. Access from the street to the first floor of the houses was guaranteed by an outside staircase known as profferlo, while the rooms on the ground floor were usually used as shops. Some houses did not face the street, but had an internal courtyard commonly known as richiastro. In the center of the medieval quarter is the square and church of San Pellegrino mentioned in a document of 1045 as belonging to the Abbey of Farfa. In 1889 the façade was restored in Neo-Gothic style by Bishop Grasselli. It was badly damaged during the bombings of the Second World War. In the same piazza is the Palazzo degli Alessandri. Built in the first half of the 13th century by the powerful Alessandri family, it was later lived in by a branch of the Alessandrini family before being broken up into different properties. The palace covered three sides of the square, as numerous family coat of arms show. Nowadays only the part of the building with the covered profferlo staircase is considered Palazzo Alessandri. The outside has a wide balcony and large lowered arch, an interesting variant of the typical Viterbo style profferlo. Next to it is a portico on massive columns and behind this, a four level tower-house Scacciaricci Tower. The palace underwent static restoration in the beginning of the 20th century. In an adjacent palace is the Museum of the Porters of S. Rosa where designs of the structures known as the Macchina di S. Rosa, carried in procession each September 3rd, are conserved. Besides the San Pellegrino medieval quarter and that of Pianoscarano, the Renaissance Palace of the Priors is also notable. This building was begun in 1265 when a first level was built: the upper level was added in the following century while the façade and portico were built in the second half of the 15th century by Pope Sixtus IV della Rovere (1471-1484). His coat of arms and that of other popes embellish the façade and interior courtyard. The artistic and historic importance of the Priors Palace reflect a happy moment for the city and a climate of great socio-cultural evolution thanks in part to the initiatives of the powerful Cardinal Alessandro Farnese, who later became Pope Paul III. In the 17th century the Palace was further enriched by the addition of an internal courtyard. Today the Palace has two large sections connected by an arch: that of the Offices, where the Prefect lives and that of the Comune, once the residence of the Priors. The exterior form today reflects works done in the 1400s. By the end of the 16th century, when the final grandiose Palace was finished, the interior pictorial decorations of the Sala Regia were begun. 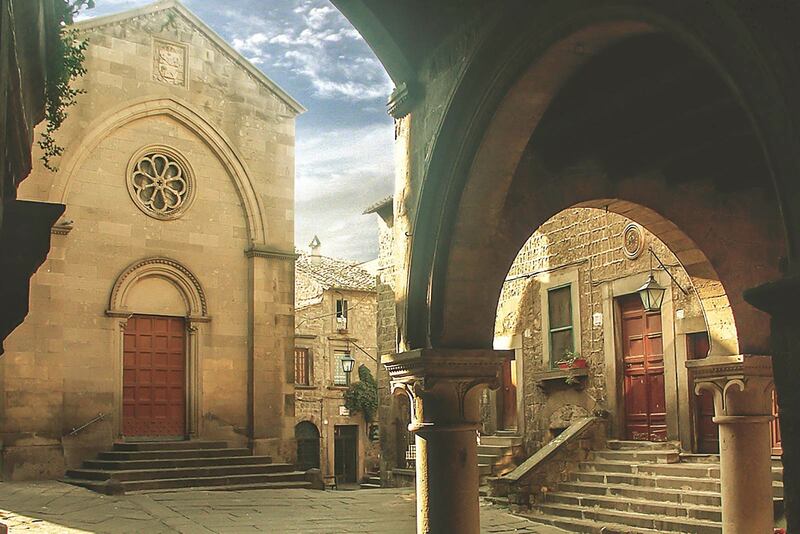 The historic center of Viterbo can be visited independently with the unique and fun MoveGlass experience.